This healthy toothpaste came to me from the foot of the Himalaya Mountains - Kathmandu. The official population of that city in 2011 was just over a million people. Americans who have never been tend to think of it as the launching pad for expeditions up Mount Everest. That's true, but it's a very small part of what happens in Nepal's capital city. My friend Jon Swanson journeyed to Nepal recently to serve people there by helping to set up an internet cafe - that will assist Nepalese people to do much more than just access the internet. (You'll have to read about his adventures on 300 Words a Day.) And Jon very kindly brought back a tube of a minty green toothpaste he purchased in the big city. This lovely paste comes to me courtesy of the Camino de Santiago - in English, "the Way of St. James" - a pilgrimage walk across the north of Spain. How did a walk provide me with toothpaste? Actually, a walker did - my friend Jim Kok. He made this lifetime journey last year and very kindly returned with a tube in hand. 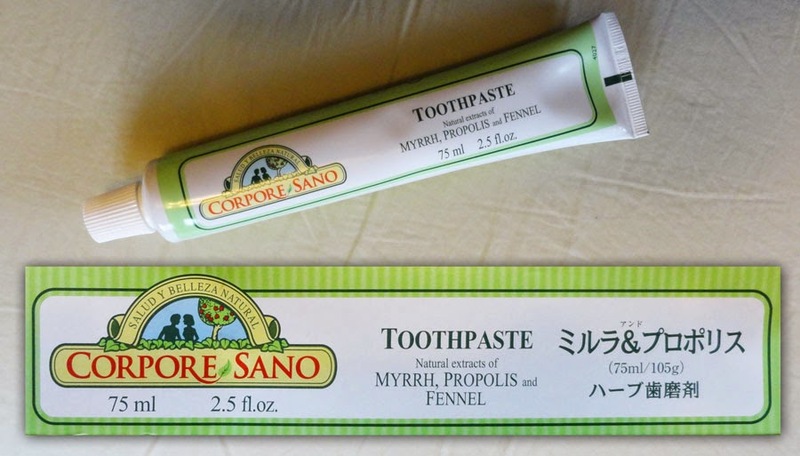 Corpore Sano is a lightly minty green paste that Jim picked up at a Spanish pharmacy. (I have found many interesting toothpastes of the healthy/natural variety in European pharmacies.) Corpore Sano is Latin for "a sound body." On the tube, three main ingredients are featured: myrrh, propolsis and fennel. I'll quote from the box: Myrrh's essential oil "is astringent and stimulating." Propolsis "purifies and strengthens, improving mouth hygiene." Fennel "also acts as a stimulant and tonic."